1Department of Veterinary Medicine; 2Department of Pathology, Faculty of Veterinary Medicine, Beni-Suef University, Beni-Suef 62511, Egypt. Abstract | The present study investigated different diagnostic techniques for the detection of Brucella species in tissue specimens obtained from cattle including culturing technique, universal and Bruce ladder PCR assays based on fresh and formalin fixed paraffin embedding (FFPE) tissues as well as histopathological alterations. Specimens from 102 non-vaccinated brucella seropositive cows were used for isolation of brucellae. Brucella melitensis biovar 3 was isolated from 86 (84.31%) cows. Additionally, universal PCR showed the presence of Brucella DNA in all tissue extracts from which Brucella melitensis has been isolated as well as DNA extracts of their cultures. The assay has amplified the target gene (immunodominant antigen, gene bp26) with fragment size of 450 bp. Bruce ladder multiplex PCR proved the presence of genetic materials of Brucella melitensis in culture DNA extracts as it amplified three fragments (587, 1071 1682 bp in length). On the other hand, Bruce ladder multiplex PCR failed to detect DNA from fresh tissues. The use of FFPE technique on positive culture FFPE specimens, revealed the fingerprints of Brucella spp. DNA in udder, spleen, supramammary and retropharyngeal lymph node targeting 450 bp-fragment using the universal PCR. Moreover, Bruce ladder amplified only the 587 bp-fragment in only one (16.66%) sample out of 6 randomly selected positive universal PCR FFPE specimens. 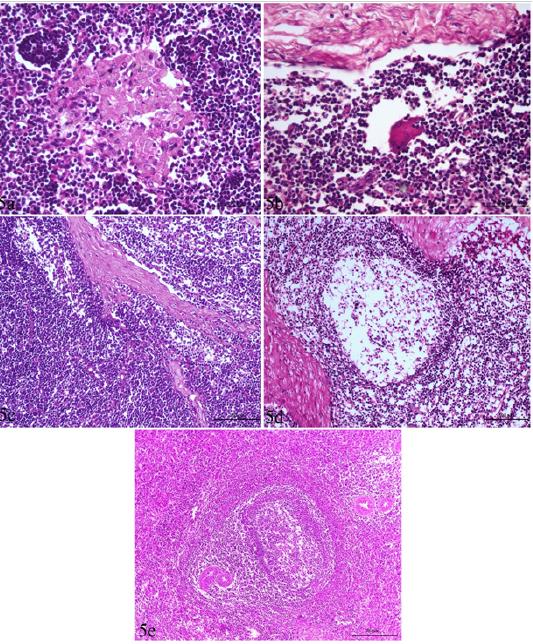 Pathological lesions in tissues of Brucella-infected animals consisted of micro-granulomatous reactions in lymph nodes and spleen. The current study tested brucellosis FFPE specimens and could effectively identify Brucella using specific primers by PCR. The immunodominant antigen, gene bp26, proved a good target for detection of DNA from FFPE tissues. Citation | Hosein HI, El-Nahass ES, Rouby SR, El-Nesr KA (2018). Detection of brucella in tissues and in formalin-fixed paraffin-embedded (FFPE) specimens using pcr. Adv. Anim. Vet. Sci. 6(2): 55-62. Copyright © 2017 Hosein et al. This is an open access article distributed under the Creative Commons Attribution License, which permits unrestricted use, distribution, and reproduction in any medium, provided the original work is properly cited. Brucellosis is an important zoonosis causing reproductive failures and significant economic losses in livestock, (Boschiroli et al., 2001; Al Dahouk et al., 2005; Bricker and Ewalt, 2005; Xavier et al., 2009a). The disease is caused by bacteria of the genus Brucella. The bacterium that does not possess classic virulence factors (Moreno and Moriyon, 2002). In Egypt, Brucella melitensis biovar 3 is considered to be the predominant biovar isolated from animals and humans as recorded by Salem and Hosein (1990); Menshawy et al. (2014); Affi et al. (2015); Hosein et al. (2016). Diagnosis of brucellosis depends on detection of Brucella spp., demonstration of specific antibody or cell-mediated immune responses as well as histopathological investigation. Because of the difficulties and limitations of the culture technique (Alton et al., 1988; Seleem et al., 2010) and the complexity of serological diagnosis that requires the application of battery of sero- tests (OIE Terrestrial Manual, 2012), the use of molecular techniques for detection of Brucella infection especially from tissue specimens was attempted by several researchers. Expanding of the range of amplification techniques to formalin-fixed, paraffin-embedded tissues lead to appropriate improvements of the diagnosis of Brucellosis. This is because Brucella organisms in many occasions fail to grow culturally. In this situation, the only available material may be a paraffin block. Formalin-fixed, paraffin-embedded (FFPE) specimens are the most precious source of diagnostic material for studying pathogenesis of a variety of infectious diseases. Cross-linking between nucleic acid strands causes problems in DNA extraction and blocks polymerase chain reaction (PCR), (Gillio-Tos et al., 2007). However, FFPE samples are commonly employed as their DNA contents, even in shorter fragments are often helpful for studying genetic diseases (Gillio-Tos et al., 2007) and are suitable for PCR requiring relatively short DNA fragments (Pavelic et al., 1996). Using diagnostic tests without evaluating their performance may create unreliable results, and consequently wrong epidemiological inferences. Therefore the aim of the present study was directed to evaluate and compare the performance of different diagnostic techniques employed for detection of Brucella infection in tissue specimens of cattle including Brucella isolation, and DNA detection in tissue specimens and in FFPE using universal and Bruce ladder PCR as well as histopathological alterations. The study was conducted in different localities including Upper and Lower Egypt (Figure 1). Between January 2014 and December 2015, tissue specimens including prescapular, prefemural, mediastinal, retropharyngeal, internal illiac and supramammary lymph nodes as well as spleen, liver, kidneys, lungs, heart, udder and uterus were collected from 102 non vaccinated brucella seropositive cows slaughtered at different abattoirs after being diagnosed as Brucella infected cases by the Egyptian veterinary authorities. Samples were collected, kept on ice and sent to the laboratory as soon as possible for Brucellaisolation and DNA extraction. Parts of these specimens were fixed in 10% neutral buffered formalin for 48 hours then processed by paraffin embedding technique. Reference Brucella strains employed in this study were supplied by the Central Veterinary Laboratory, Weybridge, Surrey KT15 3NB, UK. (Table 1). Brucella melitensis biovar 3 field isolate was previously isolated and identified from cattle (collection culture of the Department of Veterinary Medicine, Beni-Suef University). 1: American Type Culture Collection, USA2: National Collection of Type Cultures, UK. Tissues were cultured on tryptose agar medium with antibiotics selective antibiotic supplement (Ewalt et al., 1983) (Oxoid) according to Alton et al. (1988). Plates were incubated at 37 °C in an atmosphere of 10% CO2 and examined daily for 10 days for growth. 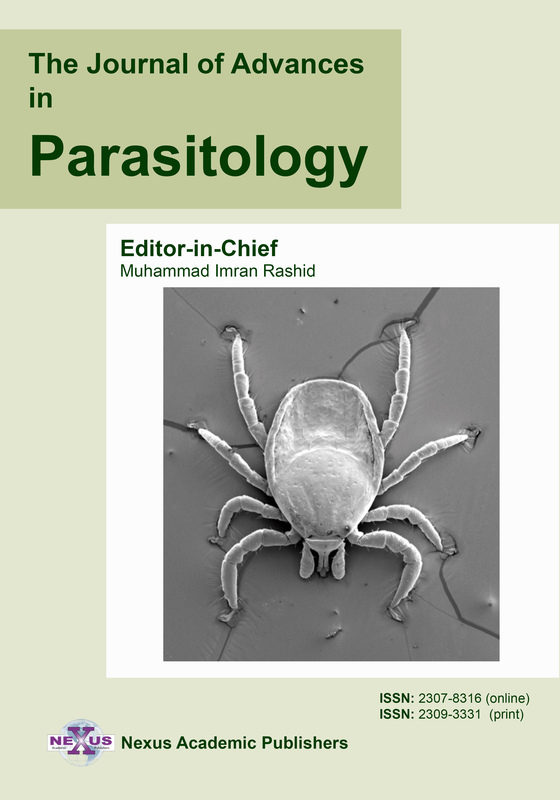 Isolates were identified as Brucella (Alton et al., 1988; Ewalt et al., 2001; OIE Terrestrial Manual, 2012). From Brucella culture: Few colonies were harvested and suspended in 200 μl of sterile, DNase, RNase-free deionized water in Eppendorf tubes. Bacterial cells were inactivated by heating the tubes at 100°C for 10 minutes. Killed bacterial cells were centrifuged at 15, 700 × g for 10 minutes. The supernatant containing crude DNA template was pipetted into new sterile Eppendorf tubes discarding the sediment. From tissue specimens: A total of 25mg from collected different tissues were subjected to DNA extraction using tissue kit (Thermo) according to the manufacturer’s instructions. From paraffin sections: FFPE blocks were microtomed at 5 µm in thickness these sections were carefully collected into Eppendorf tubes (DNase-free). Purification of Brucella DNA was performed using the gSYNC™ DNA FFPE Tissue Kit according to manufacturer’s instructions. The paraffin was removed by vortexing and 10 minutes incubation with xylene, followed by two washes with pure ethanol. The air-dried pellet was incubated with 20 μL proteinase K and 180 μL GST lysis buffer (from the DNeasy kit) overnight at 60°C. The lysed emulsion was further purified with the DNeasy spin-column kit. DNA was finally recovered in a single elution step with 50 μL AE solution. Two PCR runs were conducted; the first PCR (universal PCR) was performed for molecular identification of Brucella in DNA extracts from Brucella cultures, fresh tissues as well as from paraffin sections at the genus level according to the procedures of Bricker (2002), using PCR master mix (Jena bioscience Gmbh, Germany) in a total volume 25µl/reaction. The PCR primers were developed for Amplification of target gene (Immunodominant antigen, gene bp26), (Table 2). The second PCR (Bruce ladder multiplex PCR) was used for detection of Brucella in DNA extracts from Brucella cultures as well as from paraffin sections at the species level according to Garcia-Yoldi et al. (2006) using INgene Bruce ladder (INgene Bruce ladder VR: Batch No 180515 , Ingenasa, Madrid, Spain) employing five primers pairs (Table 3). The PCR amplification was carried out using Labnet® Multigen Gradient thermal cycler, Catalog TC9600-G- 230V(Labnet international, Inc. Edison, NJ, USA). Brucella species was defined according to molecular size of the amplified products using DNA ladder (100 bp and 1Kb), (Biomatik ® Code No. M7123 and M7508. Biomatik Corporation Ontario, Canada. Tissue specimens were collected from liver, spleen, kidneys, lungs, heart, udder, uterus and lymph nodes (prescapular, prefemural, mediastinal, retropharyngeal, internal illiac and supramammary). These specimens were fixed in 10% neutral buffered formalin for 48 hours then processed by paraffin embedding technique according to Bancroft and Gamble (2008). Five micron tissue sections were mounted on clean glass slides and stained with hemtoxylin and eosin. Brucella organisms could be detected from 86 (84.31%) out of 102 seropositive cows. Brucella cultures showed typical characteristics for the genus Brucella. Colonies were smooth elevated, transparent, and convex, with intact borders, brilliant surface and have a honey color under transmitted light. Typing of Brucella isolates recovered in this study revealed Brucella melitensis biovar 3 (Table 4). Supramammary and retropharyngeal lymph nodes as well as udder and spleen represented the most frequent culture positive samples. Universal PCR in this study confirmed the presence of genetic material of genus Brucella in all 86 (100%) DNA tissue extracts from which Brucella melitensis has been isolated as well as the DNA extract of their cultures. The assay has amplified the target gene (Immunodominant antigen, gene bp26) with amplification of the fragment of 450 bp, (Figure 2) characteristic for the Genus Brucella. Tp : Tbilisi (Tb)a: 1:50000 , b: 1:100000 , A: anti Brucellaabortus, M: anti Brucellamelitensis, R: rough Brucella antiserumure DNA extracts as the test has amplified the 587 bp, 1071 bp and 1682 bp sizes fragments (Figure 4). On the other hand Bruce ladder multiplex PCR failed to detect DNA from fresh tissues. Formalin fixed paraffin embedding techniques (FFPE) was carried out on positive culture FFPE specimens which revealed the fingerprints of Brucella spp. DNA in udder, spleen, supramammary and retropharyngeal lymph nodes with amplification of the fragment of 450 bp, (Figure 3) using the universal PCR. On the other hand, Bruce ladder amplified only the 587 bp fragment in only one (16.66%) sample out of 6 randomly selected positive universal PCR FFPE tissues (Figure 4). The most common observed alterations in lymph nodes and spleen were in the form of epithelioid cell and /or giant cell reactions especially in the cortex in the inter-follicular areas (Figure 5 a,b). 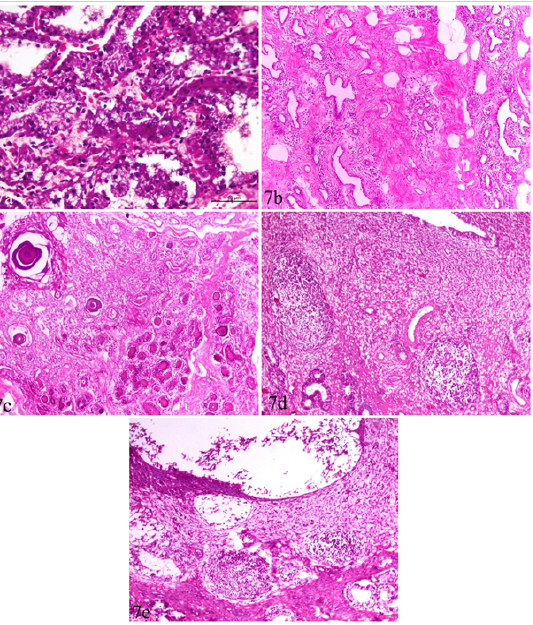 Accumulation of mononuclear cells in the subcapsular and trabecular sinuses could be seen in some cases (sinus catarrh), (Figure 5 c). Some lymph nodes exhibited fatty infiltrations in the cortex. Hyperplasia of white pulp was predominating in the spleen of most cases (Figure 5e). Depletion of lymphocytes was also seen in the white pulp of spleen and cortex of lymph nodes (Figure 5 d). Figure 5: Lymph node and spleen of brucellosis-positive cows exhibiting (a) Epithelioid cell reaction. (b) Giant cell reaction. (c) Mononuclear cells accumulation in trabecular sinuses (sinus catarrh). (d) Depletion of lymphocytes in the white pulp of spleen and cortex of a lymph node. (e) Hyperplasia of white pulp in the spleen (e). 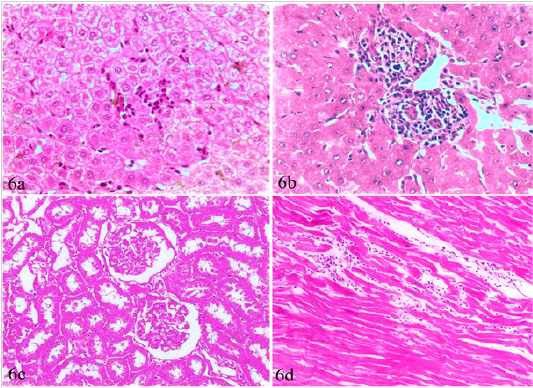 Figure 6: Liver, kidney and heart of brucellosis-positive cows showing (a) Active proliferation of Van Kupffer cells. (b) Mononuclear cells infiltration in hepatic parenchyma. (c) A kidney showing glomerular and tubular nephrosis. (d) A heart suffered from myocarditis and necrotic changes. Liver, kidneys, lungs and heart, showed non-granulomatous reactions varied from mild vacuolar degeneration, early necrotic changes (pyknosis) to mild inflammatory reactions (focal mononuclear cell infiltration). The hepatic sinusoids were dilated and had proliferated Van Kupffer cells (Figure 6a). The portal areas were infiltrated with mononuclear cells in some cases (Figure 6b). The infiltration in other cases involved the portal areas and also the hepatic parenchyma. The kidneys showed variable degrees of glomerular and tubular nephrosis (Figure 6c). The heart revealed no pathological alterations except myocarditis and necrotic changes in one case (Figure 6d). Catarrhal mastitis and chronic interstitial mastitis were seen in 5 cases (Figure 7a, b). The earlier was characterized by lymphocytic and plasma cell infiltrations with variable degrees of epithelial degeneration while the later, showed marked fibrous tissue proliferation with acinar atrophy and mononuclear cell infiltration. Corpora amylacia, in the form of bluish-red bodies, occupying the acini of subacute and chronic interstitial mastitis cases were observed (Figure 7c). Figure 7: Udder and uterus of brucellosis-positive cows showing (a) Acute catarrhal mastitis. (b) Chronic interstitial mastitis. (c) Bluish-red bodies (corpora amylacia) occupying acini of chronically infected udder. Inset in a higher magnification. (d) Moderate endometritis with focal leucocytic infiltration. (e) Endometritis with severely detached epithelial surface. Uterus showed mild to moderate endometritis in the form of focal leucocytic infiltration accompanied with edema and vascular changes and mucosal and glandular degeneration. The endometrial epithelium was severely detached leaving undulant surface (Figure 7 d,e). Trials for Brucella isolation from tissue specimens of slaughtered cows, resulted in detection of Brucella organisms from 86 (84.31%) out of 102 seropositive cows. Supramammary and retropharyngeal lymph nodes as well as udder and spleen represented the most frequent culture positive samples. Colonies were smooth, elevated, transparent, and convex, with intact borders, brilliant surface and have a honey color under transmitted light. Failure of isolation from 16 (15.69%) cows may be attributed to that Brucella spp. is a fastidious bacterium (Alton et al., 1988), not selecting a sufficient amount of tissues, or selecting samples from uninfected tissues. The test also may not work in case of low number of viable Brucella organisms as well as in heavily contaminated samples that may inhibit Brucella growth (Seleem et al., 2010). The criteria used for biovar delineation were requirement for additional atmospheric 10% CO2, production of hydrogen sulphide gas, production of urease, growth on media containing the inhibitory dyes thionin and fuchsin, phage typing and agglutination with polyclonal monospecific antisera A and M. Typing of Brucella isolates recovered in this study revealed Brucella melitensis biovar 3. 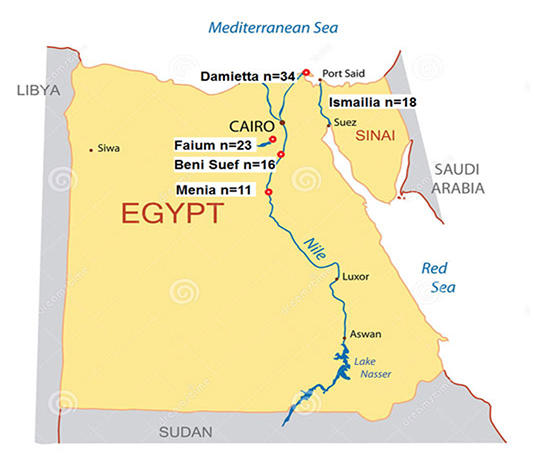 Brucella melitensis biovar 3 is the predominant brucella strain associated with animal and human brucella infections in Egypt (Menshawy et al., 2014; Affi et al., 2015; Hosein et al., 2016). The isolation and phenotypic characterization of Brucella offers a definitive diagnosis of brucellosis and is considered the gold standard diagnostic technique (Bricker, 2002). Originally Brucella melitensis affects mainly sheep and goats. Inter-species transmission of cattle may be the result of close contact between these animals in this country. In addition, World Health Organization (2006), noted that if one species of animals has contaminated an environment then animals of other species brought into the same environment, these animals can be infected. Universal PCR in this study confirmed the presence of genetic material of genus Brucella in all 86 (100%) DNA tissue extracts from which Brucella melitensis has been isolated as well as the DNA extract of their cultures. The assay has amplified the target gene (Immunodominant antigen, gene bp26) with amplification of the fragment of 450 bp, characteristic for the Genus Brucella. Bruce ladder multiplex PCR confirmed the presence of genetic material of Brucella melitensis on species level in culture DNA extracts as the test detected the 587 bp, 1071 bp and 1682 bp sizes fragments (Figure 4). On the other hand, Bruce ladder multiplex PCR failed to detect DNA from fresh tissues which may be attributed to insufficient amounts of DNA required in Bruce ladder assay. Similar results have been reported and discussed by Hosein et al. (2016) in brucella infected camels. Formalin fixed paraffin embedding technique (FFPE) was carried out on positive culture FFPE specimens. Fingerprints of Brucella spp. DNA were detected in udder, spleen, supramammary and retropharyngeal lymph nodes using formalin fixed paraffin embedding techniques (FFPE) and amplification of the fragment of 450 bp, using the universal PCR. The identification of supramammary, retropharyngeal, and iliac lymph nodes as well as udder as the most frequent culture and FFPE PCR positive tissues raises the priority of these tissues for diagnosis of brucellosis. On the other hand, Bruce ladder amplified only the 587 bp fragment in only one (16.66%) sample out of the 6 randomly selected positive universal PCR FFPE specimens. This was not surprising as the PCR assays for (FFPE) specimens require relatively short DNA fragments as supported by Gillio-Tos et al. (2007) who found that amplification of a 152 bp fragment was obtained in (69%) samples, a 268 bp fragment in (17%), and a 676 bp fragment in (5%). Moreover, Lin et al. (2009) reported that the deparaffinizing method and commercially DNA extraction kits improved detection of the DNA from FFPE specimens. PCR results supported the results of bacteriological examinations and clarified the power of PCR testing for detection of Brucella from clinical samples that could be used effectively in routine diagnosis of brucellosis. The results of the present study show the successful use of PCR assay to detect Brucella in formalin-fixed, paraffin-embedded tissues but highlight the importance of the choice of suitable target DNA size within the Brucella genome. The results of the present study indicate that the immunodominant antigen, gene bp26 proved a good target for the detection of DNA from formalin-fixed paraffin-embedded tissues as it amplifies the fragment of 450 bp. The pathogenesis and immune pathophysiology of Brucella melitensis infection is considered a key for understanding the nature of tissue damages. The Brucella organisms have the ability to replicate in the host, escape from the natural killing mechanisms, multiply and persist within macrophages (phagocytes) for long time inducing chronic infection, (Osman et al., 2016). Following infection, the organism is ingested by phagocytes resulting in bacteremia and localization in the lymphoid tissues, mammary gland and reproductive tract (Ragan, 2002). Pathologically, tissue changes due to brucellosis are found in genital and mammary tissues and in the extra-genital organs. In the current study, epithelioid cells and/or giant cells were predominant in the cortex of lymph nodes, particularly mediastinal ones, however, the typical granuloma was not found neither in lymphoid tissues nor paranchymatous organs. Such situation was associated with accumulation of mononuclear cells in the subcapsular and trabecular sinuses. This agrees with the findings of Dey et al. (2013). Adams (2002) reported that the occurrence of granulomatous lesions indicates the chronicity of the condition reflecting the nature of the persisting infection. Meanwhile, Adams (2002), Seidel et al. (2003) and Krishnan et al. (2005) explained that the most characteristic tissue alterations included inflammatory infiltrates of neutrophils, monocytes/macrophages and lymphocytes. Hyperplasia of the white pulp was evident in the spleen of most cases. However, depletion of lymphocytes was seen in the white pulp of spleen and the cortex of lymph nodes, associated with presence of fatty infiltration in some cases. This coincides with those reported by Dey et al. (2013) who found a depletion of lymphocytes, characterized by reducing densities of lymphocytes, in spleen and lymph nodes. In addition, Cheville et al. 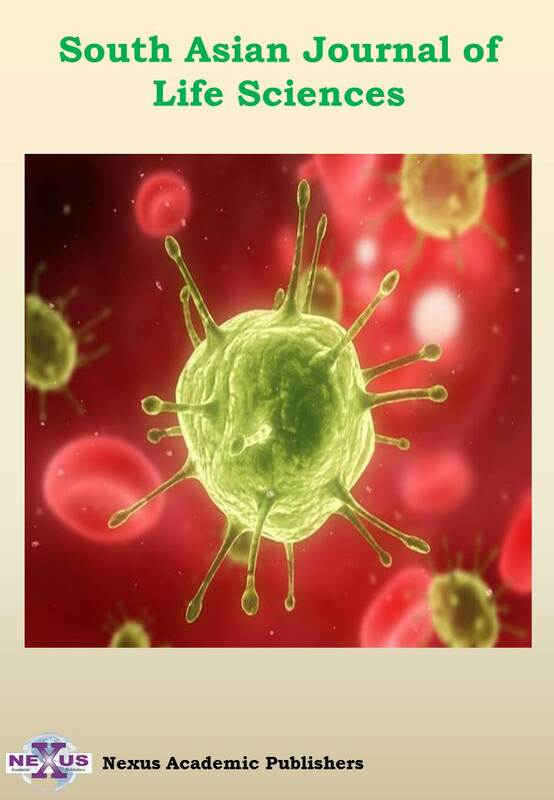 (1996) stated that lymphoid depletion may occur as a result of immunodeficiency as a result of multiplication of Brucella in the lymphocytes and macrophages of infected animals. In liver, kidneys and heart, only non-granulomatous reactions could be detected in the form of vacuolar degeneration, early necrotic changes or mild inflammatory reactions. Similar findings were reported by Dey et al. (2013) consisting of multifocal necrosis in hepatic parenchyma, and necrosed tissue was replaced by fibrous connective tissue and reactive cells with no characteristic multiple granulomatous nodules for brucellosis. Moreover, Godfroid et al. (2004) recorded multifocal small foci of necrosis or microgranulomas in the liver. Both catarrhal and chronic interstitial mastitis were pathologically detected in five cows associated with corpora amylacia formation in chronic stages. Consequently, a reduction in milk yield is expected as reported by Meador et al. (1989) who reported that Brucella induces a multifocal interstitial mastitis with interstitial accumulation of macrophages and intra-acinar infiltration of neutrophils. Furthermore, Xavier et al. (2009b) suggested that Brucella sometimes causes a mild interstitial inflammatory reaction in the mammary gland, associated with small numbers of organisms. This indicates that the mammary gland is a target organ that is important in transmitting Brucella infection through contaminated milk. In the present investigation, the main uterine changes were mild to moderate endometritis in the form of focal leucocytic infiltration accompanied with vascular and edematous changes, and mucosal and glandular degeneration which reflect the typical picture of Brucella spp. infection as a main reproductive disease. Generally, such tissue alterations or damage induced by Brucella infection may result from indirect mechanisms as activation of host immune response as explained by Oliveira et al. (2008). Finally, the identification of supramammary, retropharyngeal, and iliac lymph nodes as well as udder as the most frequent culture and FFPE PCR positive tissues raises the importance of these tissues for diagnosis of brucellosis. Brucella melitensis biovar 3 is still the prevalent Brucella strain in Egypt. PCR assays can be used without previous isolation of the organism or to complement the results obtained from phenotypic tests. DNA extraction from FFPE specimens is essential for molecular detection of genetic material in infected tissues using suitable target DNA size within the Brucella genome. 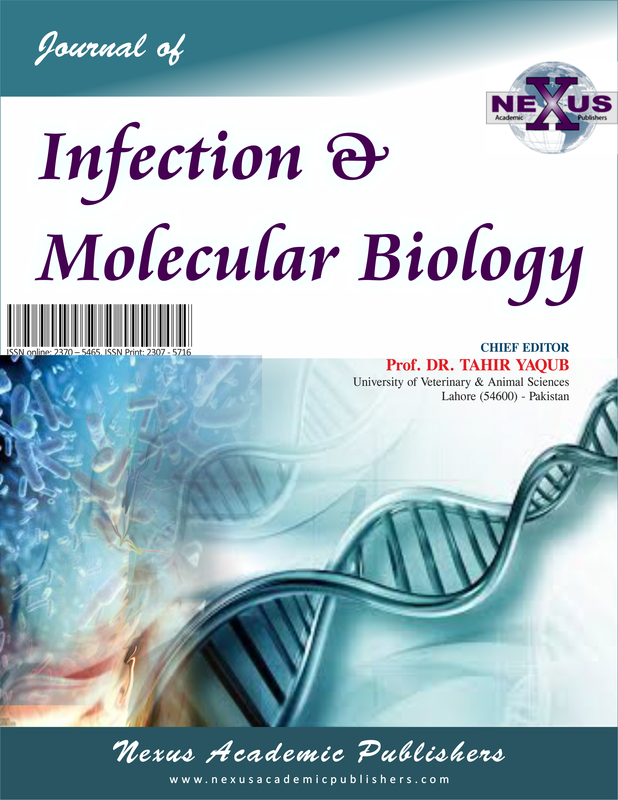 The immunodominant antigen, gene bp26 proved a good target for the amplification of DNA from formalin-fixed paraffin-embedded tissues. Brucella infection in cows caused pronounced histopathological changes in genital and lymphatic organs in the form of necrosis and granuloma formation. Supramammary and retropharyngeal lymph nodes as well as udder and spleen represented the most frequent culture and FFPE PCR positive tissues. None of the authors has a financial or personal relationship with other people or organizations that could inappropriately influence or bias the content of the paper. All authors read and approved the final manuscript. 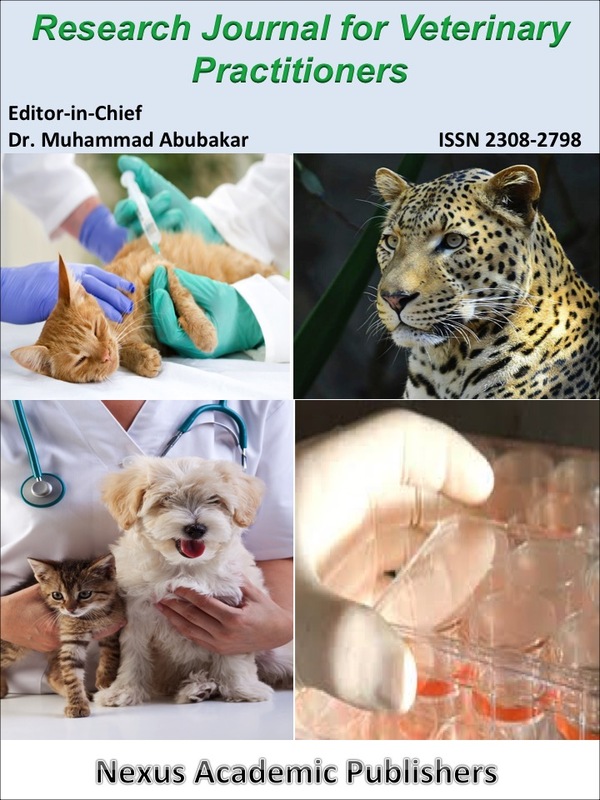 This study was supported by a grant from the project fund (Development of a DNA based new system for biotyping of Brucella strains) offered by the unit of support and funding of researches and projects, Beni-Suef University. 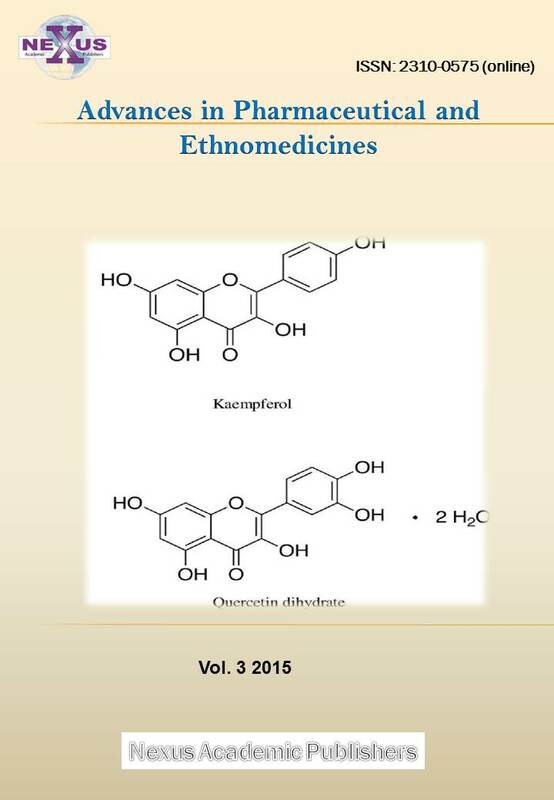 All authors contributed in creating this article and approved the final manuscript. •	Affi MM, Abdul-Raouf UM, El-Bayoumy EM, Montasser AM, Mohamad HA (2015). Isolation and biotyping of Brucella melitensis from Upper Egypt. Rep. Opin. 7: 79–85. •	Alton GG, Jones LM, Angus RD, Verger JM (1988). Techniques for the brucellosis laboratory. Vol 1, 3rd Ed. Institut National de la recherche Agronomique (INRA). •	Bancroft J, Gamble M (2008). Theory and Practice of Histological Techniques. 6thEd., Churchill Livingstone Elsevier, Philadelphia. •	Cheville NF, Olsen SC, Jensen MG, Stevens AM (1996). Bacterial persistence and immunity in goats vaccinated with a pur E deletion mutant or the parentral 16M strain of Brucella melitensis. Infect. Immun. 64: 2431–2439. •	Dey SK, Rahman MS, Rima UK, Hossain MZ, Chowdhury GA, Pervin M, Habib MA, Khan MA (2013). 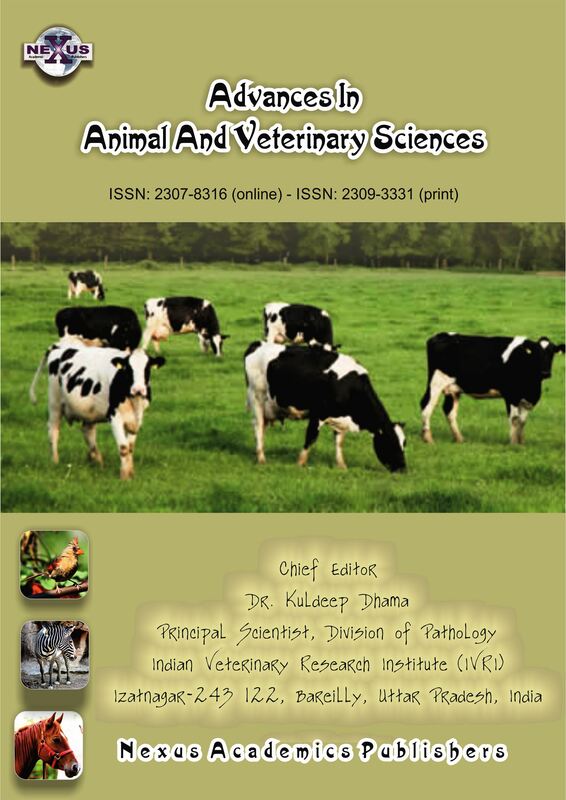 Serological and pathological investigation of brucellosis in dairy cows of Mymensingh district, Bangladesh. Bangladesh J. Vet. Med. 11(2): 107–112. •	Ewalt DR, Dunning AL, Mochal CA, Payeur JB (2001). Comparison of the metabolic tests utilizing the Warburg Apparatus and substrate specific tetrazolium reduction test. 54th the Annual Brucellosis Research Conference, St. Louis, Missouri, USA. •	Ewalt DR, Packer RA, Harris SK (1983). An improved selective medium for isolating Brucella sp. from bovine milk. In: proceeding of the Proc. Int. Symp. Vet. Lab. Diagned. Pp. 577–589. •	Godfroid J, Bosman PP, Herr S, Bishop GC (2004). Bovine brucellosis. Infect. Dis. Livestock. 3: 1510–1527. •	Hosein H, Rouby SR, Menshawy A, Ghazy N (2016). Seroprevalence of camel brucellosis and molecular characterization of Brucella melitensis recovered from dromedary camels in Egypt. Res. J. Vet. Practit. 4 (1): 17–24.https://doi.org/10.14737/journal.rjvp/2016/4.1.17.24. •	OIE Terrestrial Manual (2012). Bovine brucellosis. Manual Diagn. Tests Vacc. Terrestrial Anim. 1: 616–650. •	Osman AY, Jesse FF, Abdul Kadir A, Saharee A (2016). 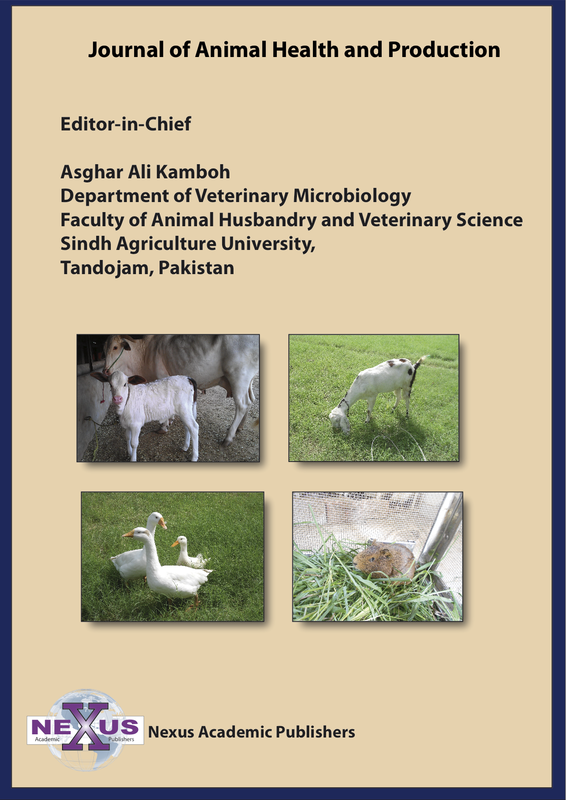 The Epidemiology and immunopathophysiology of brucellosis in small ruminants. Pertanika Journal of Scholarly Research Reviews 2(1): 11–21. •	Pavelic J, Gall-Troselj K, Bosnar MH, Kardum MM, Pavelic K (1996). PCR amplification of DNA from archival specimens. A methodological approach. Neoplasma. 43: 75–81. •	Salem AA, Hosein HI (1990). Brucella strains prevalent in Egypt. Assuit V. Med. J. 22: 160–163. •	Seidel G, Pardo CA, Newman-Toker D, Olivi A, Eberhart CG (2003). Neurobrucellosis presenting as leukoencephalophathy. The role of cytotoxic T lymphocytes. Archiv. Pathol. Laborat. Med. 127(9): e374–e377. •	WHO, FAO report (2006). Brucellosis in humans and animals: World Health Organization in collaboration with the Food and Agriculture Organization of the United Nations and the World Organization for Animal Health.